A Wake County Public Schools bus driver has been charged with taking indecent liberties with a child. 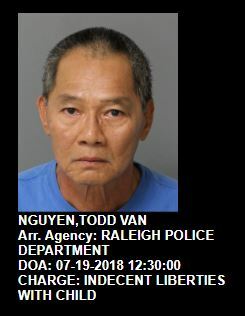 Todd Van Nguyen, age 61, was arrested on July 19 and has been charged with three felony counts of taking indecent liberties with a child. Nguyen was issued a $50,000 secured bond and remains in custody at the Wake County Detention Center. The arrest warrants show that Nguyen’s victim was under 16 years old at the time alleged crimes happened sometime during or on May 14th, 2018. Nguyen is a Wake County Public Schools (WCPSS) bus driver. WCPSS officials confirmed that Nguyen drove bus routes for Knightdale High School, Douglas Elementary and, Lockhart Elementary. “Because it’s important to keep you informed, I want to share information about a recent incident. None of our students have been directly affected by this incident. “On July 19, bus driver Todd Nguyen was arrested for [allegedly] taking indecent liberties with minors. It is important to note that the alleged victims were NOT students. I wanted to notify you immediately because our records indicate that Mr. Nguyen was the assigned driver for your student’s bus route. “While privacy laws prevent us from sharing specific details, I want to assure you that upon learning of the arrest, WCPSS officials took swift and appropriate action. They immediately began an investigation and suspended the bus driver, which prevents him from being present on any WCPSS property. Wake County School spokesperson Lisa Luten later confirmed that Nguyen has been suspended without pay. It is unclear if Nguyen was given or passed a background check. This entry was posted in CRIME, EDUCATION, LL1885, Quiet Epidemic and tagged Quiet Epidemic, Todd Van Nguyen, WCPSS. Bookmark the permalink.